With the recent release of Warrior of Chaos army book a lot of players were eager to test their new ideas and check new options available for them. Wardancer aka Eastern Barbarian also wanted to do so and I was more than happy to line up a thin blue line of High Elven warriors to test his new army. Very fast, very durable army. Even if you have flaming attacks it is probably on a single regiment and with so many trolls out there it is hard to be everywhere. What is more, a single unit of 10 Lions is bound to take casualties anyway. I was in particular concerned with Daemon Prince. I decided I will focus on the rest of the army and try not to give him too many opportunities to attack and pursuit into fresh target. However, I have found out that it didn't have dragon helm nor dragonbane gem so I also wanted to try and inflict some damage with metal magic. In general that army is well protected from my shooting but a few units, such as Giant or Dragon Ogres might suffer from focused fire. The problem was it is very well known so I didn't expect them to be that exposed. Chimera and BSB on Juggernaut were threats in themselves and I had to treat them as units. They were also a good target for metal magic spells as well as eagle claw so I wanted to use that opportunity to weaken them before the combat. The main challenge was that I actually had too many threats to deal with and not much time to maneuver as this army is incredibly fast. The presence of Throgg also meant Trolls would behave and that was solid battle line as they are also immune to psychology. I really should expect a refused flank deployment from my opponents. 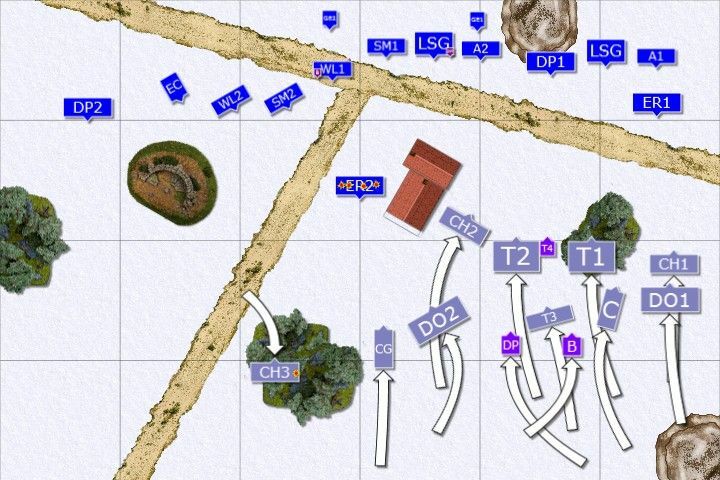 It was shown before that one way to defeat my own force is to weight heavily on one flank and charge swiftly to overwhelm my forces and deny me the chance to re-group and support from the units on the other flank. It is definitely time to design some counter measures! I was very unhappy with my own deployment. I immediately saw the danger of being overwhelmed on the Eastern flank and I had no room to maneuver there either. As a quick counter I decided to pull back to make the chances of second turn charges smaller. But I was doubtful if that were enough. Not surprisingly I lost the roll for the first turn and I watched as Monsters moved towards my lines at a double. The army of Monsters didn't wait long for the order to run towards the elven lines. Their daemonic general didn't want to keep them in check for too long before their enthusiasm would force them to attack each other. At the moment they were focused on the enemy and deep snow was not an obstacle for them at all. Elven units on the West moved fast to encircle the enemy while Eastern flank pulled back to increased the distance from the enemy. Thus giving more time for their companions to join the battle. Shooting focused on chaos hounds, to clear the enemy fast units, able to interfere with maneuvers of the elven army. Monstrous army didn't slow down and only single group of trolls and a giant were ordered to guard the rear of advancing horde. It was clear Western elven units will be too late to aid the Eastern flank. Attack is the best form of defense. Or is it? Dragon Princes and Sea guard charged as one against trolls. Lances and spears hit home but infamous abilities to regenerate wounds by trolls in a blink of an eye prevailed and elves lost combat badly. The attackers were pushed back and trolls pursued disorganized elves. Western units doubled their efforts to be ready at least to counter attack and avenge fallen comrades. Archmage was the first to bring some pain to the enemy forces. His focus was undisturbed by the daemon prince and powerful spell was cast. Daemonic general howled with rage and only thanks to his master protection he survived that barrage (Edit: I inflicted 4 wounds with Searing Doom but DP was still alive thanks to the extra wound from previous magic phase). Monsters of Chaos finally attacked too. Reavers and Archers were forced to withdraw as their futile resistance would help the enemy to keep up the momentum. Another archer unit was charged by trolls led by throgg himself and were destroyed. Thus entire Eastern flank of the elven army ceased to exist. Elves do not give up! Despite the heavy blow and the loss of several regiments at once, High Elves do not give up. Their heavy hitters are all intact and even more eager to enact vengeance. But they are not reckless and approach with a newly formulated plan. The counter attack was to come from the South, were the enemy was the weakest. Dragon Princes and White Lions prepared a trap for a giant and eagles swooped down to cause confusion. Swordmasters with the Archmage entered the central building for better battle field control and the rest of the units re-grouped the form the new line on the North-South axis. BSB of the monstrous army decided it is time for him to earn some glory and charged sea guard. Elves decided to hold but when it was clear daemonic prince is about to charge they started to have some doubts (Edit: I think they actually faced South so a little mistake on the diagram, sorry!). But then, Throgg also wanted to taste some delicate elven flesh and recklessly charged on his own. This time Elves knew they stand no chance and retreated. That left the leaders of the monstrous army dangerously exposed. On the South giant stormed White Lions who wounded it badly but didn't kill it and suffered many casualties. They stubbornly held, knowing cavalry will come to their aid any second. Dragon Princes spurred their horses and charged the wounded giant before it had a chance to swing again and killed it outright. White Lions led by BSB charged lone Throgg and even troll king was hapless against angry Chracian hunters whose axes blazed with magical fire. Finally the Archmage repeated his fit and this time Daemon Prince was banished from the existence. The only leader of the chaotic army manages to order a few of the groups to keep attacking. Chimera aids trolls but White Lions prevail and repel their attackers. Nearby second group of trolls are totally confused without their king and even the flight of their brethren does not impress them. Dragon Ogres smell an easy victory and attack great eagle but noble bird of pray manages to avoid heavy blows. Dragon Ogres are stopped, at least for a while. Seeing the great eagle in trouble, Swordmasters charge the flank of Dragon Ogres. They flee and that opens the path to aid the great eagle. Swordmasters kill one of the Dragon Ogres but it is not yet enough to push them back and bloody melee continues. Proud Dragon Princes charge seemingly vulnerable trolls alone and pay for their arrogance the ultimate price. BSB, seeing as the army is in disarray tries to break through fighting. But Swordmasters fight well and they stop their enemy. Chimera and Trolls fail to rally due to lack of any meaningful character and his inspiring presence. Another group of trolls remains confused despite the enemy very close. Only Dragon Ogres are disciplined enough to rally. Elven BSB chases trolls and chimera off the battle field. 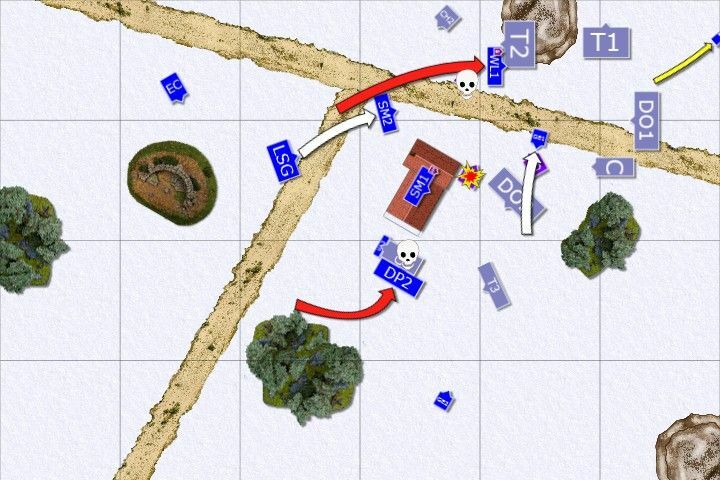 Second unit of Swordmasters charges exposed flank of the enemy bsb and kill him without mercy. Even the dragon ogre finally dies in combat. Unfortunately the charge does not help to save companions from the first regiment. By a miracle, high elves manage to repel the army of monsters but the price in blood was very high! 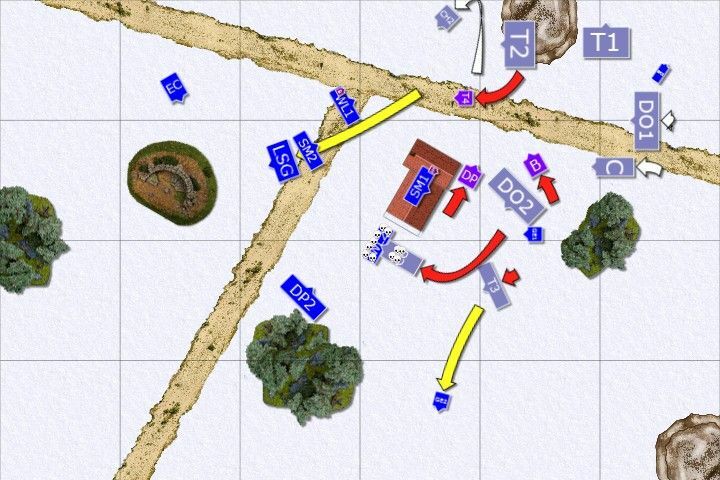 After the charge in turn 3 and a collapse of entire flank I thought I am done. I only hoped that my archmage can hunt down daemon prince. The fact I kept Swordmasters, White Lions and single unit of heavy cavalry intact gave me chances to hit back but I was sure I have already lost the game. The charge with Throgg was all that turned the tables. I think it was totally unnecessary but sometimes players tend to get bloodthirsty and I think that is what happened. After losing DP and Throgg there was no one to lead the army and not surprisingly trolls started to fail their stupidity tests. That helped a lot as White Lions could not handle another unit on their own. It was actually quite lucky they survived the counter attack by Chimera. Which is a shame as I think wardancer played a better game until that mistake with Throgg. He had a far better deployment, used his army well and limited the strength of mine. On the other hand I deployed poorly and lost many units due to that. Fortunately I didn't lose any of the heavy hitters so I had some power to hit back. Hey! I stumbled across your blog and I'm looking to get into the MSU play style with DarkElves. Seems like a challenge, and a lot of fun to play which would make the inevitable losing not as bad when trying to overcome the steep learning curve of MSU. I was wondering, what would a "swordmaster Dark Elves MSU list" look like? HE and DE have a lot of units that can fulfill similar roles so you're knowledge would be greatly appreciated! This is a list I drafted up based on reading articles on this site and druchii.net. I also wrote out some of the weaknesses I see with the list. I'd be interested to see how you would tweak this list, or if you'd rather offer a completely new example of a list not based on what I came up with, that's okay too. My reasoning on the Hydra and Kharibdyss are that they have synergy with the lore of life attribute (multi wound models w/n 12" can get a wound back just by a spell getting through) and they offer a high number of high strength attacks as well as immune to psych and the low-ish point cost that is necessary to MSU. They are a lot of fun to use also! Another unit of CoK or Black Guard could be even better though for that point cost. Another weakness with this list is lack of banners and flaming attacks. Maybe a small model count compared to other MSU armies? Not really sure what an average number for a 2400 MSU elf army is. Anyway, great blog, and I have a lot of battle reports of yours to go back and read! Sorry I threw a lot of info at you, but know there is no rush haha. I look forward to hearing from you and discussing the merits of MSU. Dark Elves are a great candidate for MSU also because it was their idea in the first place. MSU appeared on Druchii.net long time ago in 6th edition where they had to struggle with getting something out of the poor army book.The tools they have now make it even more appealing. I actually think every army can have their version of MSU, even Dwarves! I saw Tomb Kings having lots of successes with Entombed Beneath the Sands units, Empire with their combined arms approach, and yes, even Dwarves. However, because the armies are obviously different they need to find their own approach to that style. Dark Elves are good at it too but they don't have to focus on that at all. I haven't thought about particular army list with DE yet but there are a few units I really like and would try to include. Your army definitely includes them so let me use your force as an example and I am going to comment on it a little. Just some food for thought of course! It is a solid set up. Your characters are fast, well protected, can still join units and be used where needed the most. Cloak master is more of a unit of one while sorceress and BSB will be more focused on leading. Life magic is very good but if you don't get Dwellers and are not ready to cast it with 6 dice then it might be hard to draw dispel scrolls off. Fortunately, this does not have to be the case because you have warlocks and your spell selection looks much better now. It is a good idea to have it to heal the monsters and hopefully you can do it faster than they get hit! I am a big fan of fast cavalry and I like Dark Riders the most. I also think Dark Elves should use their speed as one of the main weapons and I would add 3rd unit instead of corsairs. Also because I think the bigger regiment will serve as bodyguards for the Sorceress. In that case you might need second fast cavalry unit to harass the enemy. I would give them all crossbows too. It is far more annoying to be shot at while the units move and with AP they have good chance to kill something too. It adds to your shooting phase as well. Witch Elves are great combat unit and despite their obvious weaknesses such as no armor and frenzy that is double edged sword, they pack insane amount of attacks. Because you have many other regiments it should be possible to provide some cover and to keep them in check until they need to be unleashed. Executioners and Cold Ones are your hard hitting units. They might work well with Black guard as an anvil or bait too. 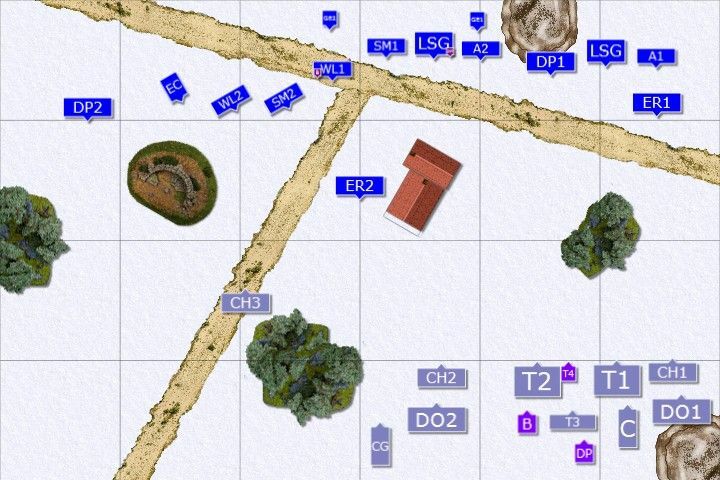 You just need to remember you have combat units that might not be able to duplicate their roles so you would need to make sure you get the most out of them and deployment and movement will need to be even more careful. It does not mean that if you lose Executioners you have no hard hitters but since they hit in a different way it might require careful planning. For instance, they are I5 and should strike before many enemies. Your Hydra might need to receive a few blows before she strikes. Bolt throwers don't need any explanation and Shades are great too although I would try to get two units as well. Doomfire warlocks are in every DE army and I am not surprised. They are just too good to leave them at home and as I have already mentioned, add to the variety of the magic phase greatly. In general, I think you should start play testing the army as it is because that is the best way to see what works for you. It is a very important factor many players omit. Your own personality and style of play. Preparing the right list is important but it is also a process and your army will evolve naturally even for the sake of trying new toys. I would consider the environment too, for example, do you play scenarios? Because if yes you might need more standards for instance. Feel free to add more comments and questions, be it here or in relevant topic on Druchii.net. Second is a report by Silas7 where he used war beasts, can be helpful as well (even if he got smashed often :)) and you might check some of his other reports. He is not playing MSU but his reports are always good. Hey again! Thank you for the great advice on the proposed list and reading material. I read the Silas rep and will listen to the podcast as soon as I get the chance. I agree with your assessment of the list and the need to playtest extensively since personal preference, comfort, and style are so much more integral to a MSU list. Having said that, I drafted a new list that I will playtest (barring any glaring weakness you see) that may be stronger/more forgiving. The major changes are increasing redundancy and model count, adding in standards, etc. The major tradeoffs were dropping a level on the sorceress and getting rid of her bunker, but she could still move between units as needed for protection, but it will just require more foresight on my part. Here is my "final draft". In the meantime, I'll keep back-reading your and SmithF's bat reps and painting druchii shields haha. Thanks for all your help! Sorry for delay! You have many more models indeed, more redundancy too. However, what I have immediately noticed you don't have champions and musicians. They are very important, in particular for your fragile infantry units. Champions can simply challenge powerful individuals and the ability to hold one on steadfast can be what buys you more time and use other elements to swarm the unit you want to defeat and deny it any support. Musicians will be great for rally purposes (as you might do some fleeing to get people into traps) but also for so important swift reforms. Speed is one thing, maneuverability is another and does not equal speed. I am currently experimenting with units of 6 of fast cavalry with champion and musician. That means I can charge enemy solo characters, challenge them, stay on steadfast and keep them busy in their turn too. Good advice for sure. I'm going to add champs to the black guard units and musicians to the execs. Seems like the logical choices. Champs in the black guard to help them stick around longer with stubborn Ld9 is perfect. And more maneuverable high strength attacks with the execs should be beneficial. Not to mention the other benefit that execs are one of the few units that could actually elect to flee (BG and witches are immune to psych). So that could help set up some favorable situations. Adding a musician and champ to all those units would start making them too expensive in an elves army, so I tried to prioritize the selections. I'll just have to make sure to deploy well to set up all the necessary "tools" to be in the best possible situation which is important for an MSU army anyway haha. I love the idea of the 6 man steadfast fast cav unit! Situational but very effective against the right opponents. DRs and reavers should be perfect for the role. I'd love you to write up a bat rep sometime using that set up. Would make for a fun read! I am glad you like my suggestions! As to 6 man fast cavalry units I am already using them (started last tournament) but didn't have the chance to employ that tactics yet. I will let you know how it goes in the future! I am really sorry for such a long delay! I hope you will find the most recent report I have just uploaded interesting! I will do my best to keep updating this blog more regularly (as I used to :)). However, it is great to know I still have some visitors who are checking for news. Thanks a lot for that, very much appreciated! Swordmaster is back!! This is a great day indeed! I have some witch elves to paint this morning, but sometime today I will devour that batrep and leave my thoughts in the comments section for that report. I'm sure it's brilliant. MSU is a tricky style as it has high risk factor and it is not often possible to win big but it rewards you with more interesting games.